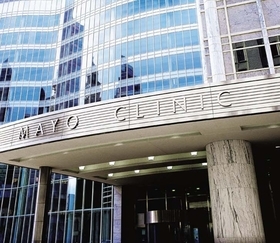 Rochester, Minn.-based Mayo Clinic more than doubled its operating income in the third quarter to $182 million, up from $86 million in the third quarter of last year. An increase in expenses to $2.79 billion, up from $2.63 billion, related to higher labor, supplies and services costs, did not offset its revenue gains, according to its third-quarter earnings report. The highly touted health system saw its total revenue increase 9% to $2.97 billion, up from $2.72 billion, driven by a boost in patient revenue and positive returns on investment. Its operating margin nearly doubled to 6.1% in the third quarter, up from 3.2% over the same period last year. While Mayo Clinic's balance sheet improved, it continues to be harshly criticized by residents and public officials of Albert Lea, Minn., who decry Mayo's decision to strip services from the rural community's hospital. Mayo had announced June 12 that it is transferring inpatient services at Albert Lea involving overnight hospitalization for illness or major surgeries, the intensive-care unit and childbirth to its Austin, Minn., campus, about 23 miles away. In return, Mayo is moving the inpatient psychiatric services unit from the Austin to the Albert Lea campus. Mayo executives have said that it is no longer feasible to duplicate some of its most complex and expensive healthcare services in neighboring communities given the financial struggles community providers face. But Albert Lea residents said the area economy would not be able to sustain the cuts from one of its biggest employers and the 1,000-plus jobs it provides. Patients have had to travel longer distances to receive care and quality of both life and healthcare have suffered, said Mariah Lynne, co-chair of the Save Our Hospital organization. "We are left with a mix of services that is not meeting the healthcare needs of the 55,000 patients it serves, which impacts the marketability of our community," she said. In response, Mayo said that it provides care for everyone in need as a mission-driven, not-for profit organization. "We are proud to serve all of our communities and will continue to offer the highest quality of care that our patients have come to expect and rely on," the company said in a statement. Mayo is putting profit over patients, said Jennifer Vogt-Erickson, vice chair of public relations for Save Our Hospital. "They are capitalizing on the challenges of rural healthcare rather than trying to solve the problem," she said. "Look at its $182 million in operating income. If they chose to take on the challenges rather than remove services, they could." In the meantime, Save Our Hospital and community leaders will explore attracting another provider to compete with Mayo or legal avenues to combat the changes, Lynne said. The state attorney general, Lori Swanson, already unsuccessfully lobbied Mayo President and CEO John Noseworthy to delay the restructuring to give time for a financial review. Rural hospitals like the one in Albert Lea are feeling the pain of lower reimbursement levels, rising bad debt related to high-deductible health plans and dwindling admissions. Since 2010, 82 rural hospitals have closed nationwide, according to data from the University of North Carolina's Sheps Center for Health Services Research. If they haven't closed, they've shed services. More than 2.4 million women didn't have access to hospital-based obstetric services in 2014 as 9% of rural counties lost all OB services between 2004 and 2014 after maternity wards closed in 279 counties, according to a study published in Health Affairs in September. Nearly half of rural U.S. counties were without hospital OB services over that time, researchers found.